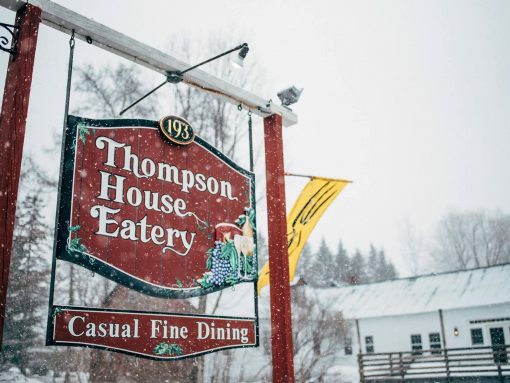 Thompson House Eatery - Jackson NH and Mt. Washington Valley Area Information. Pumpkin People, Tradionally Yours Events, Lodging specials, Dining and Ski Area Info. Fresh, local food and a dream realized. Here at the Thompson House Eatery, we spend each day in close proximity to each other, all working toward a shared goal, with an incredible staff. In the height of the summer, our garden produces 90% of our produce, herbs, as well as all of our flowers. We source beautiful ingredients from local farmers that have become friends with and grow our own microgreens, in-house, year round. We make everything in-house from scratch. With a daily changing menu, we give 100% to our hospitality and food every day.